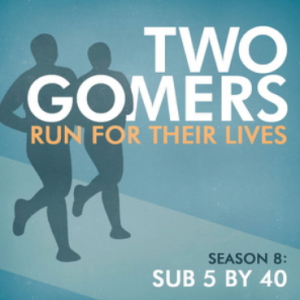 The Gomers are feeling the increased training in this, the 13th Episode of Two Gomers Race a Triathlon, but that won’t stop them from updating you and trying to be upbeat! Anthony tries nose plugs and a swimming cap, and likes one of them. 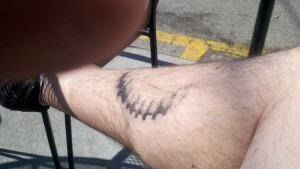 Steven gets Jelly Legs after tying his first biking/running brick workout. Baby wipes are good for more than wiping your baby. Bikes are special to people, and they talk about them. Drawing for the free tech-shirts takes place. We thank a bunch of people for being awesome and generous. And Steven gets a tattoo. Monday Survey: What’s the one bike tip you’d wish you’d known as a beginner? Happy Running! Clipless pedals are amazing. They make the bike feel like a part of you. My first pair was clipless on one side and a normal pedal on the other side. I never used the normal side. I can’t stress enough how great they are. Just make sure you practice clipping in and out a few dozen times while stationary and with some thing to hold onto. Just one leg at a time though.